Starting out from the capital Santiago, this unforgettable Atacama Desert tour has been designed to include the best sights and experiences around the Atacama Desert region and its communities. This is a private tour and you will be accompanied by an English-speaking local guide during all excursions. The price displayed is per person based on two people sharing. All tours can be tailor-made to suit your interests and requirements. 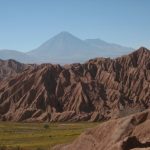 This Atacama Desert tour starts in the beautiful city of Santiago,before heading north into the heart of the Atacama Desert. You will discover the cultures, landscapes and history of the Atacama and its people, and experience life within its traditional and indigenous communities. Chile is one of the most visually diverse countries in the world. Stretching over 4,300 kilometres in length, it is edged by mountains and ocean, dotted with deserts, lagoons and salt flats, and bursting with colourful cultures. The Atacama Desert is well known for being the driest desert in the world. There are places where rain has never been recorded. The Atacama is not a sand desert though. Instead it is made up of incredible mountains, volcanoes and stark rocky terrain. Thanks to the mountains, there is water in the highlands (if you are lucky, you will experience some amazing thunderstorms!) and this makes the Atacama even more unique. Wildlife has evolved to adapt to these conditions, so you will see three different species of flamingo, geese, coots, ducks and avocets, among many others. Vicunas, Guanacos and Lamas also live in these extreme conditions. Santiago has a totally different landscape. The Andes Mountains rise up over five thousand meters on one side, while the valley is fertile, temperate and perfect for wine-growing. The city parks and tree-covered hills add to its unique landscape and it is one of the most developed cities of the southern hemisphere. In the Atacama Desert you’ll visit the Lickan Antay people who are both promoting and strengthening their community by welcoming visitors into their homes and showing them their way of life. Travel with Sumak and you’ll meet these traditional groups of people face-to-face, learn about their beliefs, sample their cooking, shepherd llamas and be taught how to plant crops according to the night sky. The varied geographical landscapes of Chile are home to a multitude of wildlife. On this trip you’ll see rare species of birds, lagoon-dwelling flamingos and llamas. Along the way you’ll hike through dramatic ravines, natural geysers and multi-coloured valleys. You’ll listen to ancient stories and legends, experience breathtaking landscapes, beautiful sunsets and star-filled skies on an in-depth tour of incredible high-altitude Chile. You’ll be welcomed at the airport and driven to your comfortable hotel in the centre of Santiago. The rest of the day is free for you to relax or head out and explore the city. 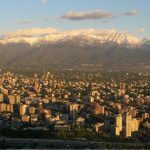 Hit the central market and La Vega; visit the Plaza de Armas, the Cathedral and the National History Museum; or simply wander through the streets of the Bellavista, Lastarria, Brasil and Yungay neighbourhoods. We can also arrange an optional guided City Tour or Wine Tour for you. After breakfast, private transfer to the airport for your flight to Calama (approx. 2 hours). Once there you’ll be welcomed and driven to your comfortable B&B in San Pedro de Atacama (approx. 1.5 hours). During the evening you will take a private guided hike through the amazing Death Valley. 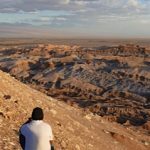 The hike starts at a high vantage point from where you can enjoy views of the Atacama salt flats, the Andes mountain range and the oasis town of San Pedro. From there you’ll descend through the dunes into the valley for an exciting introduction to the incredible landscapes of the Atacama Desert. After breakfast at your hotel, the morning is dedicated to a Lickan Antay experience. The Atacameños, or Lickan Antay, have inhabited the desert for thousands of years and have learned how to live in it and discover all its secrets. On this excursion, your guide will show you the story of his family and the economic activities carried out in the desert. We will learn from them how to grow corn and alfalfa crops, about animal farming and other typical Lickan Antay crafts and skills. At lunch, you will experience an Atacamenian meal and during the evening, you will experience an Ancestral Caravan with llamas. 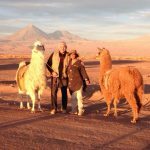 This excursion allows visitors to relive the wonderful experience of walking with llamas in the Atacama Desert. Our local guide will teach you more about the history of the desert, their relationship with llamas and travel. The Atacama is one of the best places in the world for stargazing and in the evening you’ll be picked-up for a small group guided excursion. Your local guides will show you the Andean constellations and stars and explain how to understand the cosmos according to ancient inhabitants of the Andes. After breakfast, you’ll be met at your hotel for a private excursion. You’ll set out to explore on foot, hiking through a dramatic ravine and past volcanic rock formations. The ravine is full of cacti of several different species, the biggest of which is the Equinopsis Atacamensis, growing up to eight meters high. You’ll enjoy a traditional lunch in Sequitor with the locals and the rest of the afternoon and evening are free back in San Pedro. Free day in San Pedro de Atacama town. Optional activities include a museum tour, renting a bike or taking a horseback riding tour. After breakfast you’ll be met for your small group excursion to the Talar salt flats. On the way you’ll stop to visit Socaire, a small village located at 3500 meters above sea level. Here you will be met by a local guide who will teach you the history and traditions of the village. You’ll enjoy lunch in a typical restaurant in Socaire then continue your trip to the “Altiplano” (plateau). In the afternoon you’ll visit the Altiplanic Lagoons and the Talar Salt Flat. The evening is yours to enjoy back in San Pedro. 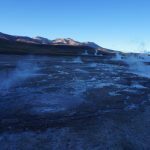 You’ll have an early start to visit the Tatio Mallku geothermal geyser field small group excursion, one of the most impressive in South America. Here you will observe different kinds of geysers and swim in the thermal pools. The field sits at 4300m and temperatures vary between -5 and -20 degrees Celsius, so be prepared for extreme conditions. On the way back you’ll visit Machuca Village, where you can try llama “anticucho” (not included), buy handicrafts and observe animals that live in the area. 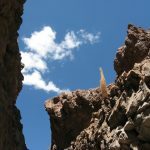 This evening you will join a small group for a guided hike through the Moon Valley and its ravines. During winter you’ll enjoy a spectacular sunset in the park and a star-filled sky (in summer the park closes before nightfall). 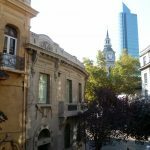 Free morning to make the most of your remaining time in San Pedro. In the afternoon or evening you’ll be picked up at your hotel for your private transfer from San Pedro to Calama and your flight to Santiago. In Santiago you will be picked-up at the airport and transferred to your comfortable hotel in the city centre. 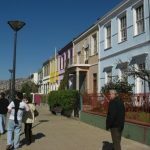 Depending on your flight home you may have time to relax and explore the city some more, or perhaps add an optional tour of the nearby coastal town of Valparaiso, famous for being the home of Pablo Neruda. In any case, you’ll be picked up from your hotel and transferred to the airport in plenty of time for your homeward journey. Comfort level: Adventure: Accommodation in hostels (always in a private room) and B&Bs, and sometimes in hammocks, rustic cabins or tents. Internal transport is overland rather than by plane wherever possible. Note: this is a guideline; please refer to the tour detailed description for what is and is not included. You will be greeted at the airport on arrival by a local guide who will take you to your hotel and will be able to answer any questions, make any additional arrangements and generally ensure everything goes smoothly. No minimum number of passengers required and you will not be travelling with a group of people you do not know. Prices quoted are per person and based on at least 2 people travelling. You should expect a cheaper price for a bigger group. Passport is required at time of booking. For information on visa requirements and health formalities you can visit the FCO Travel Advice Website (UK citizens) or the US Travel Advice Website (direct links to Chile page). Information on money changing in each destination, as well as what it is customary to tip for various services, will be provided. This trip, like most of our adventures through Latin America, has a low level of physical difficulty and participants can choose to do as much or as little as they like. If you have any concerns or require special arrangements please call or email us to discuss. What to bring: Travel insurance, passport, binoculars, alarm clock, walking shoes, water bottle, daypack, sun protection, insect repellent, sun glasses and hat, swimwear, flip-flops, torch with extra batteries, wind and waterproof jacket, warm clothes to layer, warm socks, fleece, hat, gloves, scarf. Extra budget recommended: Around £200 / $250 pp to cover meals and all other expenses not included in the itinerary. What is included: Welcome reception at the airport. Transfers (some may be shared) and internal flights. Overland transport. Accommodation. Entrance fees to sites of interest, museums and national parks mentioned in the itinerary. Guided activities and excursions with English speaking guides (some private, some as part of a small group). Meals as stated in the itinerary (B= Breakfast, L= Lunch, D= Dinner). Contributions to the social projects visited. Donation to help in preserving the Amazon rainforest through agro-forestry and education. What is not included: Flights from your country of origin. Travel insurance. Alcoholic drinks. Additional meals or snacks. Travel within and around each town. Visa fees (if any). Tips. Souvenirs. 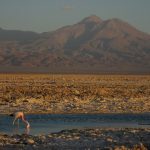 Tagged as active, Andes Mountain Range, Atacama Desert, bird-watching, cultural experiences, cultural heritage, desert, geysers, hiking, indigenous peoples, salt-flat, sightseeing, traditional gastronomy, volcanoes.